Remember this is one big shared tree. Very easy to do, with the proviso you cannot delete people. (We do not delete people but unattached people are periodically checked for merging) Look to the right of the spouse you want to fix (this assumes you are logged on and have editing rights to that family). On TNG, because the tree is collaborative and not a series of individual trees, the permissions are set so that you cannot delete a person or family. 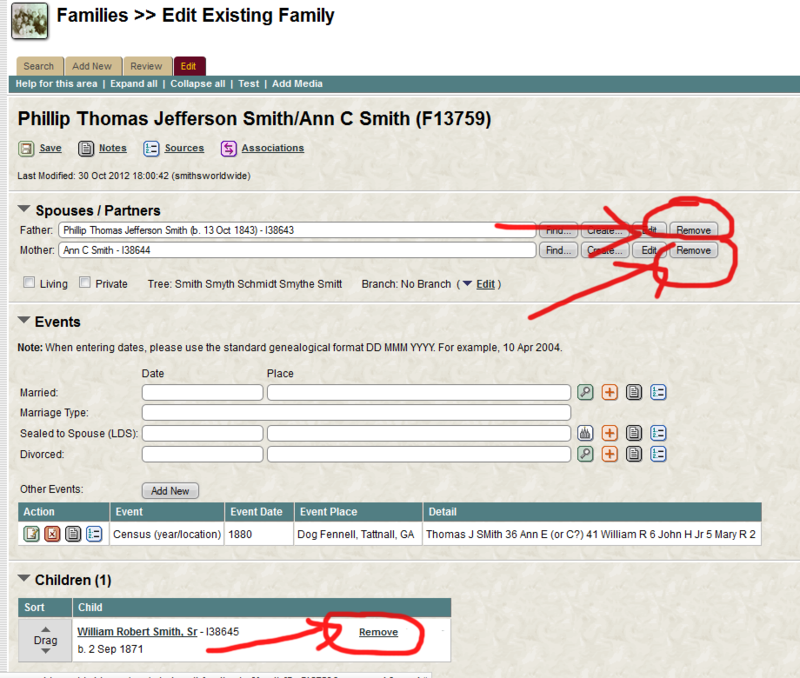 You CAN *remove* a person and if you want them removed from the database or merged, just send us an email request or we will ourselves occasionally run through the database and look for merges or other extraneous information.On the family screen, look to the right of the person – you will see FIND, CREATE, EDIT and REMOVE. You can REMOVE that person.Removing that person as a spouse will NOT delete that person from the database. So, if you, for example, had Jane Doe as a spouse for John Doe who had 2 wives and Jane is actually the spouse for the 2nd family, just remove her and then FIND her on the new family and add her back. Be sure and always save your changes. Same for children. You will see REMOVE to the right of a child. click and then save. This is really handy when a child belongs with a different family or there’s an error or if you discover there’s another generation between the supposed parents and the child. In that instance, add the child who is the correct one, make a new family for him or her, and then FIND the child you had removed and add him or her back. And save. If you accidentally make a second family for the same people, you can go into the family you want to change, REMOVE the father, REMOVE the mother, and REMOVE the children and then save. Your OTHER family will not be affected.